Why it’s daunting: The stigma of The Monkees’ origins lingers on. The group was entirely prefabricated, and it has a reputation as a group that didn’t write its own songs or play its own instruments. Those impressions have put a tarnish on the group’s recorded output, making it hard for purists to move beyond the band’s best-of collections. Assembled by Bob Rafelson and Bert Schneider in 1966 under the musical supervision of producer Don Kirshner, The Monkees came into existence when Rafelson and Schneider saw The Beatles’ A Hard Day’s Night and decided television needed a comedy about a rock ’n’ roll band. 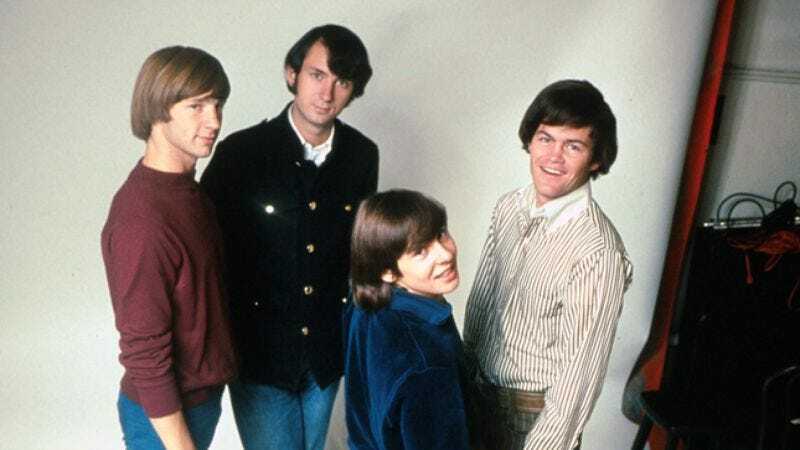 After a rigorous casting process, four young men—Micky Dolenz, Davy Jones, Michael Nesmith, and Peter Tork—were selected to serve as Monkees. All had a certain degree of musical and/or songwriting prowess, but they were hired just as much for their charisma and onscreen chemistry. The show quickly proved successful. The Monkees ran for two seasons and piled up 58 episodes, earning the Emmy for Outstanding Comedy Program in 1967; it remains a syndication staple to this day. The group’s numerous hit singles—three No. 1s and a total of 12 top-40 hits—have also continued to win over listeners. But that’s still a lot of Monkees to dig through, particularly for people who are dubious about the band to begin with. Why: It’s easy enough to get past the perception of The Monkees as a band that didn’t write its own material. Nesmith’s songwriting contributions can be found as far back as the band’s self-titled debut, and others started to pitch in with the second album. With the group’s third album, Headquarters, The Monkees decided to play their own instruments as well. Bummed because they, understandably, weren’t being taken seriously as recording artists, The Monkees staged a revolt in 1967 that began when Nesmith started a discussion with Kirshner about the group’s desire for more input into its own music. It’s an understatement to say that conversation went poorly: When Kirshner’s attorney told Nesmith to check his contract, Nesmith punched the wall and snarled, “That could have been your face!” Fortunately, Rafelson and Schneider felt Nesmith’s pain and suggested the foursome try to play together as a proper band, and after corralling Chip Douglas of the Modern Folk Quartet as producer, The Monkees gave it a go. Although there are a few other musicians in the mix here and there—those aren’t Monkees playing the cello and French horn on “Shades Of Grey”—the end result is almost entirely the work of Dolenz, Jones, Nesmith, and Tork. It’s easy to hear how much fun they were having in virtually every groove of the record. And although Headquarters hit the top of the Billboard album charts, it did so without ever having a hit single in the U.S., leaving its contents ripe for rediscovery. Next steps: As the second album featuring The Monkees playing their instruments, Pisces, Aquarius, Capricorn & Jones Ltd. tends to get mentioned far less than Headquarters, but barring the short burst of silliness that is “Peter Percival Patterson’s Pet Pig Porky,” it’s the most consistent album in the group’s catalog. It contains one of The Monkees’ strongest singles (“Pleasant Valley Sunday”), and features Jones bouncing through Jeff Barry’s “She Hangs Out” and Harry Nilsson’s “Cuddly Toy,” Nesmith sinking his teeth into Michael Martin Murphy’s “What Am I Doing Hangin’ ’Round?” and Dolenz mucking about on his new Moog (“Daily Nightly”), an instrument previously unheard on a pop record. Although a slightly less likely place to find new appreciation for The Monkees, the Missing Links collections—a trilogy of albums devoted to culling previously unreleased songs and alternate takes—serve as a highly entertaining alternate-universe greatest-hits set, offering a look into the group’s sonic diversity while also revealing the behind-the-scenes issues the group had to deal with as recording artists and TV stars. Highlights of the series include the lost single “All Of Your Toys” (shelved due to publishing issues; its slot on the release schedule was given to “A Little Bit Me, A Little Bit You” instead), Jones’ jazzy “My Share Of The Sidewalk,” Tork’s tunes “Come On In” and “Lady’s Baby,” and Nesmith’s lovely “Nine Times Blue,” which he rescued for his own Magnetic South album in 1970. Also poor places to begin your musical journey with The Monkees: the Tork-free Instant Replay and The Monkees Present, both of which were released in 1969, to diminishing commercial fortunes. The inclusion of all four members didn’t always insure quality, however; 1996’s Justus ranks as one of the most disappointing reunion albums by any band, studio-created or otherwise, and it only features one song worth listening to a second time: “Circle Sky,” an unnecessary re-recording of a track from the soundtrack album for the group’s lone cinematic outing, 1968’s Head. On a related note, Head isn’t a particularly good place to begin a Monkees education either, and that sentiment goes for the movie and its soundtrack album. “Porpoise Song” is one of the loveliest songs of the psychedelic era, but it’s also included on most of The Monkees’ many greatest-hits collections.